It’s the Monday before Thanksgiving. Do you know where your gravy boats are? …The Superbowl/World Cup/Puppy Bowl of food holidays is finally here, people, and GOSH if we’re not ready to eat/win/use a bunch of ill-themed metaphors/multiple backslashes to emphasize our excitement. So, are you ready? Did you order your bird? Restock your baking drawer? Dust off that one nice serving platter you have but never use because it’s a pain to wash? And if you haven’t spent hours, days or even months preparing for Thursday (because maybe you’re a normal person who doesn’t spreadsheet out her menu and grocery assignments? Cool, whatever), not to worry! I’m here to share my favorite, classic, won’t-take-all-your-time-and-energy-but-will-please-everyone Thanksgiving recipes. Don’t want to make a whole turkey? I don’t blame you. Make a juicy, sage-scented, stuffing-filled turkey roulade! On a sheet pan! There’s a little prep work up front, but the payoff is definitely worth it – tender meat, juicy skin, roasty veggies, and stuffing that’s built right in. Wine-wise, Caroline says: 2014 Château de Pibarnon Bandol Rosé ($16). Rosé is not just for summer! This rosé (and others) from the Bandol region drinks like a lighter style red. Made from a blend of two red grapes (Mouvedre and Cinsault) this wine compliments both the richer root vegetables and bright acidic cranberries in this dish. Earthy potatoes and sweet pears are an entirely underrated duo, especially when roasted to sweet, salty perfection. As easy to eat as they are to make! Chardonnay is known for its flavor profile of orchard fruits (apples and pears) making it a perfect match here. This Chardonnay is cold-fermented, giving it a crispness, acidity and minerality that makes the mustard dressing sing! There is just the slightest kiss of oak on the finish which provides structure and roundness for a creamy mouth-feel. This wine will help to convince even the biggest “Chardonnay haters” to give this varietal a try! Another simple, beautiful and delicious side dish – this one pairs deeply roasty acorn squash and bright, fresh arugula. This is a fuller bodied wine with a great balance of fruit and acid; exactly what you’re looking for to prevent any palette fatigue with all of those flavors on the table! An underlying minerality gives this wine a certain zip that compliments both the buttery roasted squash and the peppery arugula. It’s not Thanksgiving without cranberry sauce, and this one is full of bright, fresh, zippy flavor. Make it today! This jewel-toned relish keeps for days, and will be more than ready to zing up your turkey table come Thursday. Pinot Noir is the classic Thanksgiving wine! Lighter in body, bright acidity, ripe red fruits and little tannins, it’s the perfect food wine. This version from Robert Sinskey has a nose full of cranberry and raspberry, followed by a hint of spice. This. Pie. Is. Just. SO GOOD. Rich and sweet, nutty and complex. The perfect foil for a scoop of lightly sweetened whipped cream. It’s just not Thanksgiving without this particular pie. Thanksgiving dinner deserves a special pairing at the finish. 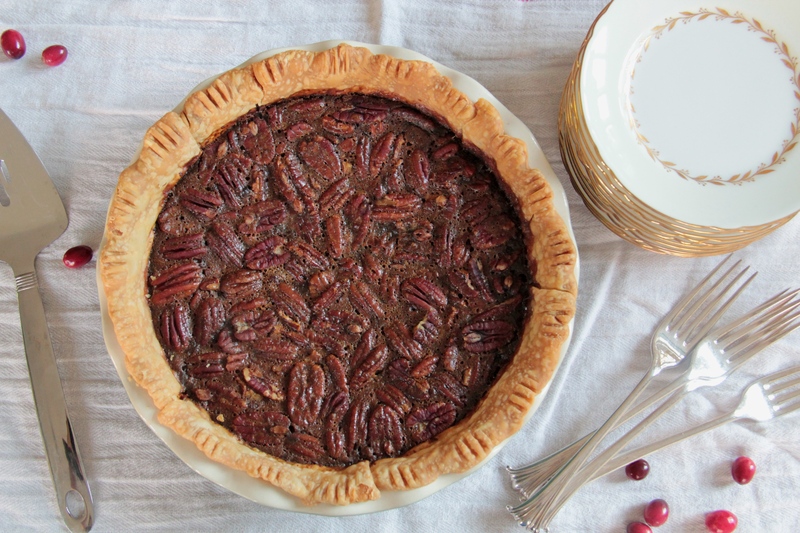 This vintage port comes from the Douro region in Portugal – extended barrel aging gives it a smooth richness, with notes of caramel, dried fruit, and a nuttiness that compliments the brown sugar custard base and pecans in this pie. A twist on the classic pumpkin pie, this subtly-spiced, sweet little number sits on a buttery gingersnap crust and is piled with a healthy/unhealthy amount of marshmallow meringue. It’s Thanksgiving – finish strong! A sweet dessert wine to match a sweet, spiced pie. With a delicious bouquet of honey and stone fruit, this wine maintains a nice acidity, so it can stand up to the sweet potatoes and toasty marshmallows here. So, lovely friends, there you have it. Food and drinks for all. A happy, healthy and pie-filled Thanksgiving to you! Love this post!!! Bravo for Thanksgiving and wine pairings! Yes to all of this! Yum yum yum delish!! !